Students at George Vanier Catholic School in Combermere and St. John Bosco Catholic School in Barry’s Bay enjoyed a visit from our local Member of Provincial Parliament John Yakabuski on February 1. MPP Yakabuski put his musical talents to work at both schools, leading the singing of O’Canada. At George Vanier, singing of the national anthem was followed by a tour of the school and a talk with students about how Mr. Yakabuski started in politics, his role as an MPP, and his job in the Legislature. He informed Grade 7 and 8 students about the Page Program and encouraged students who are interested to explore politics as an option. “The students were excited to welcome Mr. Yakabuski to George Vanier and were thrilled with the flags, pins and brochures that he brought for them,” notes Principal Maureen McHale Enright. 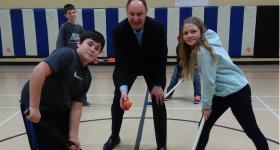 Following his talk, Mr. Yakabuski performed a ceremonial ball drop for the lunchtime floor hockey game. Mr. Yakabuski spoke to students at St. John Bosco in a school-wide assembly and visited ‘The Zone,’ a room where students with anxiety, worries, etc., can hang out safely. Mr. Yakabuski agreed that promoting and supporting mental health and wellness in youth is critical, and was impressed that St. John Bosco Catholic School has taken steps to provide students at risk with a safe and caring place to visit during the school day. Following his visit to The Zone, Mr. Yakabuski spent time with students in smaller groups to talk about his work in public office, and answer students’ questions. Mr. Yakabuski explained that the best part of his job is helping people, and things that seem so small or simple for him and his staff have changed the lives of some of his constituents. He also encouraged students to be efficient with their time and do the best they can with the hours they are given, and noted that setting high expectations and working hard to accomplish them will bring both happiness and success. “Students learned so much—fun facts (for example, Mr. Yakabuski is a graduate of St. John Bosco), as well as critical messages about doing the very best you can with each day you’re given,” says Kelly Etmanskie, Teacher, St. John Bosco Catholic School.